MIAMI, FL -- A friend of mine once told me the greatest obstacle we face as Latinos in the 21st century is our native language. The formality of Spanish and its unwillingness to adapt to modern society would hold us back. I tried to counter his argument - but he was right. While my English-speaking friends used phrases like ‘email’ and ‘tweet’, I was stuck in Spanish with ‘correo electrónico.’ In the fast pace of modern society we were being held back by the language of Cervantes, where for every one word in English you need five in Spanish. Fortunately the award-winning Zubi Advertising has provided a Latino Emoji app to help us make a quantum leap forward. Divided by countries, people, flavors, folklore, slang and a Spanish keyboard, the app enables users to give each other a hard time by taking advantage of our diverse and surreal expressions as well as honoring our respective heritages with a quick choose and paste. Why send a smiley face when you can send a Celia Cruz or a Frida Kahlo? Argentinians can boast about having their Pope emoji while Puerto Ricans have their awesome mofongo; there are food emojis for the different Caribbean and Latin American countries. A cow on top of a frying pan? Why "vaca frita," of course, a classic Cuban flank steak. Even more hilarious are the graphic takes on common phrases used in some of our countries - such as a mango sitting on a rice bowl ("arroz con mango," which means a total mess) or a head of lettuce with a face on it ("cara de lechuga" means someone is pretty shameless). They're fun as they are smart. We sat down with Iván Calle, Executive Creative director of Zubi to talk about its creation. What sparked the idea for Latino Emoji? IC: "All the hoopla over Apple's taco emoji caught our attention. In conversations with my creative staff we were saying, ‘Sure, a taco is good, but so much hype for a taco?’ It’s fine, but a taco only represents one country.’ And that’s where the idea was born." "We realized there was a need for emojis to speak to the diversity of our community. Our food, our slang our cultures are different from one country to another. Sometimes you’re speaking to somebody in Spanish and you don’t understand the meaning of the expressions they’re using. Those are the things that make us unique. And we thought ‘You know what, we should create emojis that truly represent who we are, where we’re from and divide them by country because we have thousands of different ways of expressing ourselves.’ That’s what inspired us." Ivan Calle, Executive Creative Director at Zubi, who oversaw the team which created the Latino emojis. 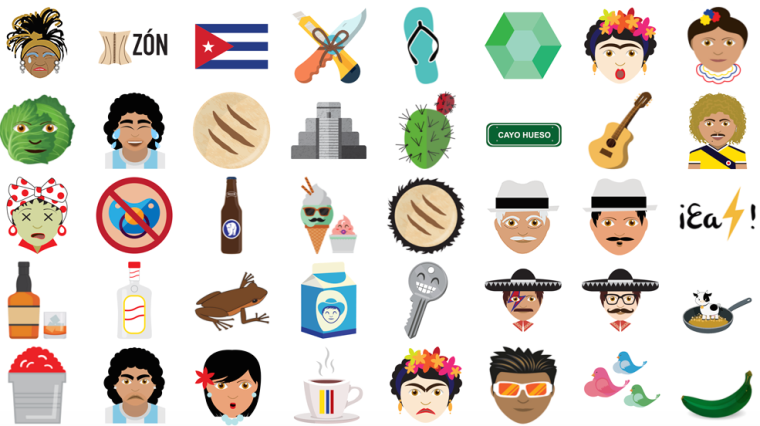 What’s been most surprising about the rollout of the Latino Emoji keyboard? IC: "Emojis are the new form of rapid expression across different technologies. Even though basic smiley faces work well across the board, there was a need for emojis that would capture how Latinos authentically express themselves." "But we didn't realize how desperate people were for it. We got 10,000 downloads on launch day and people started interacting with them immediately." "Another thing that surprised me was that people in 100 countries have downloaded this app. Not only Hispanic countries - it's been downloaded in Angola, France, England, Japan and they’re using it. Which confirms something we have always known - Hispanics are everywhere." Something that struck me about the app was the emoji’s design. How did you develop each emoji? IC: "We wanted to represent how we really talk. That was part of our mission. We wanted to be authentic. Back to the taco, Mexicans will tell you that the taco emoticon is not authentic. Here at Zubi, we’re a sort of United Nations. We have Ecuadorians, Peruvians, Cubans, Colombians, Argentinians, Venezuelans." "So we picked designers from each country to design their country’s emojis. We consulted with each other throughout the process so we had firsthand knowledge of the authenticity of every emoji we wanted to create. For example, every arepa we created is an arepa that Venezuelans actually eat because the woman that designed them is Venezuelan." The emojis are funny. Was that a goal for you? IC: "We tried to capture how Hispanics use a lot of expressions that have double meanings. Our slang is humorous and exaggerated. We’re dramatic and charming and passionate. We wanted to graphically capture that. We also wanted to get all those phrases we use to one up on each other and pull each other's leg. It’s part of our culture. So every country has a section of emojis to give each other a hard time. We wanted to include that because it’s how we really talk among ourselves." "At the end of the day it's a form of communication. And if you don’t have a way of communicating that reflects how you truly speak, you’re being limited." We found it particularly fitting that it was Zubi Advertising that would bring this idea to the market. Can you speak to that a little bit? IC: "When Tere Zubizarreta started this agency, there was no ‘Hispanic Market’ to speak of. She is an icon. She gave birth to Hispanic marketing and she did it as a woman almost 40 years ago. She was truly impressive and the Smithsonian in DC agrees - they added her body of work to their collection." "Zubi as a Hispanic Marketing agency composed of Hispanic employees. We were the natural environment in which to cultivate this idea." Latino Emojis are available free of charge from iTunes or Google Play. The most recent update added Holiday Latino traditions to the keyboard, so go download them and Happy Holidays!